What if something happens and you CAN’T evacuate before a hurricane? What if it’s too late to evacuate before the storm makes landfall? While it’s easy to say, “Oh, they should have left earlier” and run through the gamut of blame, the fact remains that there are all sorts of reasons that leaving didn’t work out. There are a million reasons that someone could be stuck facing a hurricane whether they intended to or not. The point is, for many, there comes a point when it’s too late. There is no further option for escape from what will most likely be a category 3, 4, or 5 hurricane. Here’s an explanation of the categories. I can’t urge you more strongly: evacuate if you can at all when officials say that your home is in peril. (Here’s an evacuation checklist.) When a life-threatening hurricane is headed your way, leaving is the wisest course of action. What should you do if you can’t evacuate? A hurricane headed your way can be a life-threatening emergency. Not to scare the daylights out of you, but this is what it looked like on a webcam in St. Maarten during Irma. You’re going to want to do what you can to be ready. If you have waited until a day or two before landfall, it’s too late to order online. There is practically no chance that the items will reach you. You aren’t going to be able to buy standard hurricane supplies at the store at this point, either, so you’ll have to make due with what you have or can still acquire. 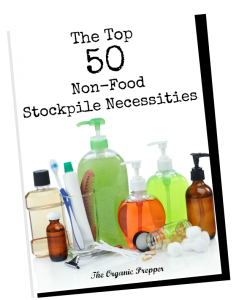 I wrote this article about substitutes you can find when the store is out of standard emergency supplies. Let me be absolutely clear, lest someone accuse me of recommending that people remain in their homes: remaining at home is not a wise course of action. If you haven’t been able to evacuate, call your local police department or other emergency service and ask if they can help you get to a safe shelter before the storm hits. Do not wait until the storm hits to ask for help. Be proactive and do so now. If you have absolutely no other option, below, you can find the best advice I can offer. What if water is sold out? Water will be sold out across the region. But, your taps are running just fine, right? Fill every container you can get your hands on with tap water so that you have something to drink. It’s likely that you can still buy containers that will hold water. Get Mason jars, pitchers, canisters…whatever you can find to hold water. Then fill ALL of them, immediately. Use empty soda bottles or water jugs, too. Fill one-gallon Ziploc bags with water and freeze them, allowing room for expansion. Not only will this provide drinking water, but the ice will help keep your food safe for longer. When the storm is about to hit, fill sinks and bathtubs with water. This can be used for sanitation. What should I do about prescription medications during a hurricane? Fill prescriptions for any essential medications immediately. Plan for at least 2 weeks of medication to be on hand in the event that pharmacies are closed after the storm. If you run out of your prescription and it is necessary for life, you can go to the local hospital after the storm has passed. Bring in your current bottles so that they can see the date the meds were last filled, the doctor’s name, and that you still have refills. Prepare for a very long wait, because they will be seeing others who were injured during the storm. What food should I buy if I can’t evacuate? If there’s anything available, buy food that doesn’t require any cooking. At this point, you can’t afford to be picky. Get enough for at least a week, preferably two. There’s a good list here of substitute supplies and there’s a list here of no-cook food. Keep some cash on hand, preferably in small bills. If there is a regional power outage, you won’t be able to use a debit card or credit card during the aftermath. I suggest keeping several hundred dollars if you can. Go out and take all the cash possible from the ATM machine, then make some small purchases (lighters, snacks, water bottles) to break the bills. There are always shelters set up for those who could not evacuate. Check city government websites or call your local police department to find out where the shelter nearest you can be found. Particularly if you are in a manufactured or mobile home, there is practically zero chance it will be able to withstand winds of 180 mph or greater. You must relocate to a sturdier location. Secure anything outside that could become a projectile. (Barbecues, bicycles, outdoor furniture.) If you can’t secure the items, bring them inside. Clear your rain gutters and downspouts. This will help reduce the risk of flooding in some cases. Trim trees. If you have branches hanging over your home, remove them if you can. If you can’t, do not use the room beneath the branches for shelter during the storm. Turn off propane and outdoor utilities. If recommended by officials, turn off the utilities to the house. If the power goes out, turn off your breakers to avoid potential surges. Unplug appliances except for the refrigerator and freezer. Set those at the coldest setting to keep your food safe for as long as possible in the event of a power outage. Board up your windows to reduce the risk of injury from flying glass. Keep curtains closed for added protection. Do NOT tape them – see the video below. If plywood is not available, use regular boards. Chipboard will not hold up to the combination of hurricane force winds and rain. Secure exterior doors. While it may not be sufficient, you can use a bar or place a large piece of furniture in front of them. This is not for home security. It is to keep the powerful winds from blowing them in. Find the innermost, sturdy part of your home in which to take shelter during the worst part of the storm. Stay away from windows and skylights. A downstairs closet, hallway, or bathroom may be the best option. If you have a basement, this could provide the most safety. Shelter under a sturdy piece of furniture. You’ll feel like a dork, but if you have a helmet for bicycling or riding a motorcycle, wear it. In a high-rise, floors 3-10 are considered to be the safest. Above and below those floors, people should evacuate or take shelter between those floors. Watch for storm surges. If you’re near the coast, 10-20 foot storm surges are expected. Not only can these cause tremendous structural damage, but if you are caught in one, you could drown or suffer serious injuries by being slammed around by the water. Don’t be fooled by the eye of the storm. There is a lull during the eye of the storm that can deceive people into believing that the worst is over. Unfortunately, high winds are likely to pick back up again shortly, so don’t be caught off guard. This lull can last anywhere from 5 minutes to 45 minutes. For a much more detailed plan, grab my book, The Prepper’s Hurricane Survival Guide. It’s a PDF so it will be available instantly for download and printing. 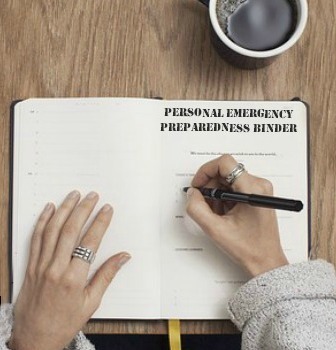 The book will tell you what to do before, during, and after a hurricane with checklists and plans for a wide variety of situations. TThe following video has some useful tips. The aftermath is dangerous, too. Any tips from those who have weathered a hurricane at home? Please share your advice in the comments section below. Your suggestions could save someone’s life. Due to the extreme nature of this situation, I urge you to be civil. In other words, if you’re a jerk, I’m deleting your comments. Very best wishes to those in the path of danger. Please keep us posted when you can.